Sandals surprised the nation on Tuesday, announcing it would be pulling out of the proposed Tobago project at Buccoo. The signs, though, were all there. The first one was last October, when Sandals founder, Jamaican billionaire Gordon “Butch” Stewart, complained to local media at a press conference in Barbados that “TT was one of the most political countries” in which he’s ever had to operate. He admitted he had never seen the memorandum of understanding signed between Sandals and Government but then said cryptically: "There is nothing saying that Sandals have to develop in Trinidad and Tobago, there is nothing that says I am tied to, or for the company that I represent that says we must do that. We have given our word that we are going to work with the government, develop a contractual arrangement under our direction." He continued to distance himself, adding that the TT political system had the potential to drive away investors as either of the two political parties were always against each other. The second sign was on January 6, during part one of the Prime Minister’s report to the nation. Dr Keith Rowley appeared to refer to the deal in the past tense, saying, “I’m expecting we would have chased away what would have been good for us.” Listing several Caribbean nations with Sandals hotels, Rowley scoffed, “Tobago is the only place in the Caribbean we hear a Sandals project would bring leprosy.” When reporters asked Tourism Minister Randall Mitchell the next day to clarify the Prime Minister’s meaning, Mitchell reaffirmed the deal was on. 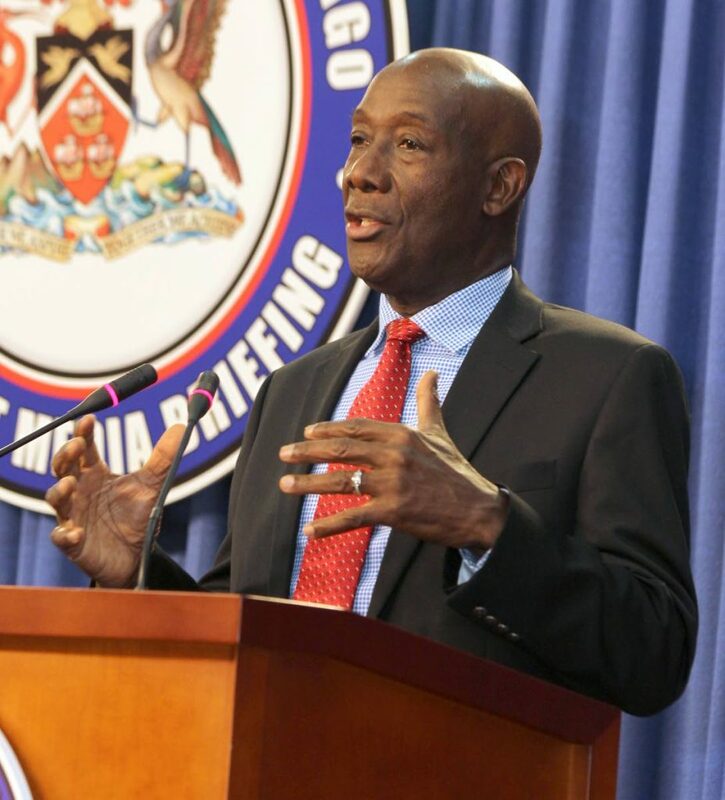 Less than a week later, though, at his Conversations with the Prime Minister in Tunapuna, Rowley again suggested the deal was in the past tense, though he remained ambiguous. "The Sandals project in Tobago and I am tempted to say 'were advancing in Tobago,' is a project meant to be bringing to TT, Tobago in particular, a brand; a world-class brand with a model which is proven to be successful across the Caribbean… We call it a shot in the arm for the people of Tobago. And it would not have killed off the small business in Tobago. As a matter of fact, the opposite would have happened because there were more options for more areas to bring more people to Tobago, not all of them using the airlines to go to the Sandals hotel,” he said. 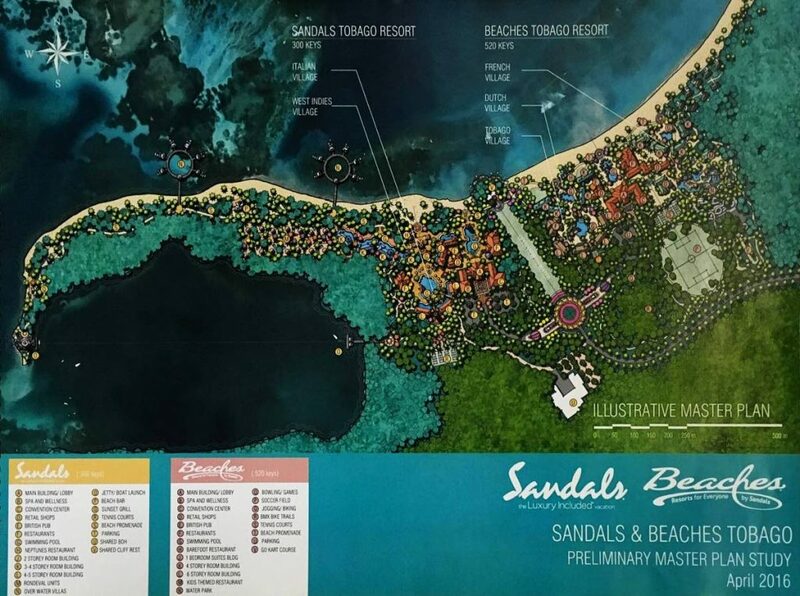 The preliminary master plan for the Sandals and Beaches Tobago resort. Commercial negotiations have not yet begun, he stressed, and all costs so far were the burden of Sandals, not the people of TT. From the beginning, though, he said, since the deal was announced, to now, reports in the media have begun percolating in the press, “creating questions and news reports for us that are unnecessary.” It was a “consistent and persistent badgering of the same subjects over and over again,” he said, and while the company did not want to shy away from making statements, it was like walking in circles. This type of negative press, Rainer said, was different to the negative press the company has had to deal with before, most recently, allegations of sexual assault against a guest by a member of staff at one of the company’s hotels in the Bahamas, because it’s somewhere where the brand already exists, as opposed to Tobago, where it has no physical presence. “We can deal with positive and negative press. That’s your right for press. But I believe you have to be objective. We can deal with the truth, we can deal with objectivity, we have no issue with that but there is the point where you have the opportunity from a commercial point of view to say I have a limit as far as I go because I am not present. You make a choice,” Rainer said. Communications Minister Stuart Young was adamant though that Government had tried its very best to bring a brand they thought would have lifted the economy not just of Tobago, but Trinidad. “Today what occurred was the loss of an opportunity due to the negativity put on the Sandals brand only by a handful of people and I think that’s the lesson here for TT,” Young said. The Sandals project was first announced by the Prime Minister, during a political rally, in June 2016. Rowley said the project was part of Government’s plan to get the island’s economy out of the doldrums, in part by stimulating tourism. Sandals was Government’s sole selection, something it had been clear on as a luxury brand that would anchor the island’s tourism appeal. 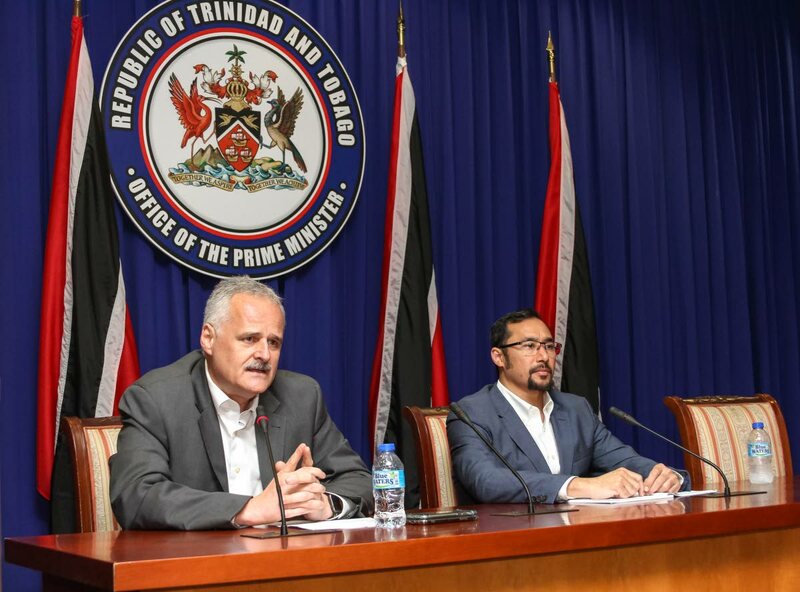 That September, after a “marathon presentation” from the company at the Tobago House of Assembly, Tobago stakeholders said they were “very happy” with the initial concept. 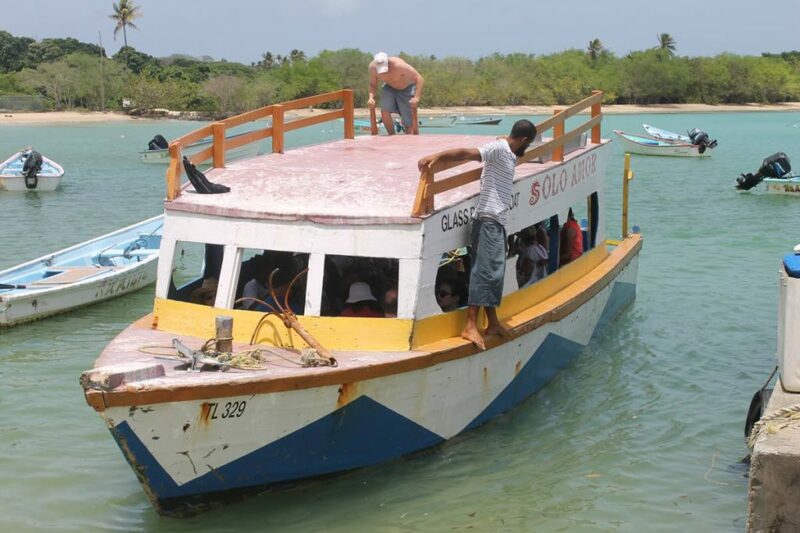 There was, though, controversy from the start, since the proposed spot in Buccoo was considered perilously close to protected environments, including the Buccoo Coral Reef, the Nylon Pool and No Man’s Land. There were questions about how the new project would impact the natural environment, including pollution and run-off from construction and operation, as well as public access to the beach. 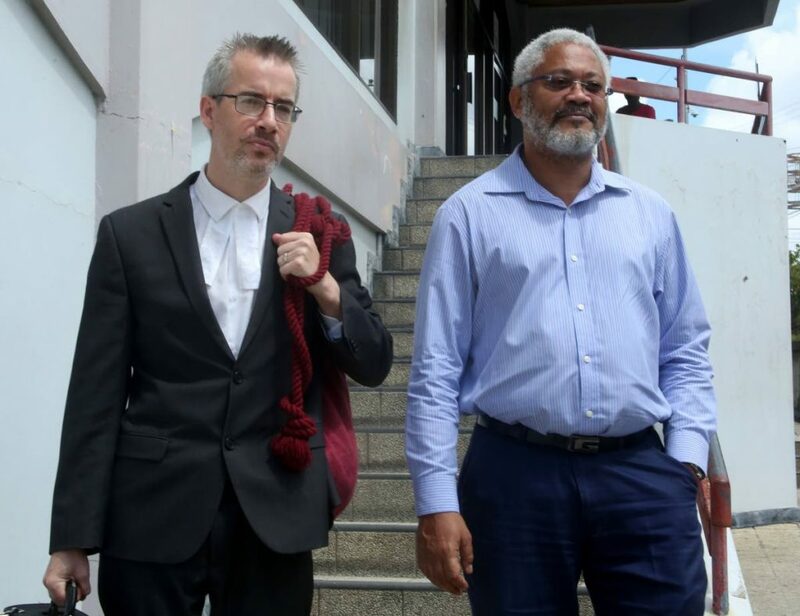 There were also questions about procurement practices, and Opposition activist, Devant Maharaj filed a claim with the Integrity Commission, in September 2017, asking that it investigate the procurement procedure for Sandals. In October 2017, a memorandum of agreement (MoA) was signed between Sandals and government outlining the basic terms and conditions for the project to go ahead. This MoA was not made public until a year later, and not before a public furore, including a High Court order granted to procurement activist Afra Raymond in October 2018, that he would be allowed to petition Government for the MoU in the public interest, under the Freedom of Information Act. Raymond was also critical of the model by which the facility would be run, namely that Government would provide the land and financing to build the project and Sandals would operate the hotel under its brand. The company would also receive attractive tax incentives. The resort would have had 500-750 rooms, and 2,000 permanent employees, along with “significant linkages to the local economy.” The government estimated it would earn US$80 million per year from taxes and other payments, while the project would add value to the tourism industry, while driving sustainable economic development. It was unclear, however, how the project would be financed. Reply to "PM: We chased Sandals away"